Resume Maker with an amazing collection of easy resume & templates. Creating a Magically Professional CV & Resume is not more than five minutes task if you have Resume & CV Templates by CA for Pages Mac OS app on your device. This truly professional and easy resume builder pro app gives you well-designed CV and Resume templates as per modern tends in the Job Market. Are you worried about how to write a CV? Well, you don’t need to go out in search of some professional drafter and composer to draft your resume and CV. Just download Resume & CV Template by CV from Apple Mac Store, discover stunning Apple Pages templates resume and start creating your resume. It is said the first impression is the last impression, and your resume is the thing that can create an impressive lasting impression on any employer. For a quality CV, a good resume format is important. 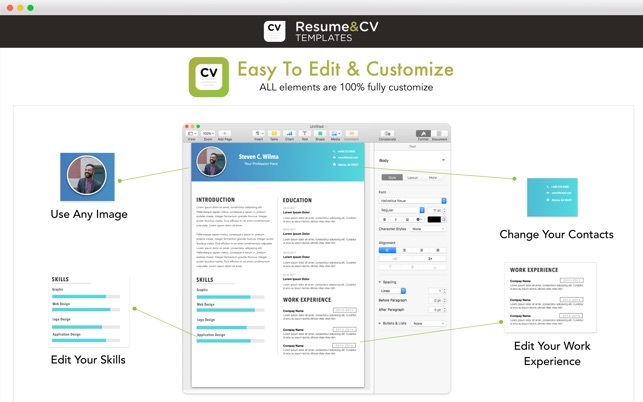 Resume & CV Template by CA for Pages Mac OS app helps in creating that powerful, long-lasting impression. In Resume & CV Templates by CA, you will see the collection of amazingly designed modern and graceful resume template or CV template collection. You can choose any resume template of your choice, or you can download more CV template gallery if you want to broaden your choice. 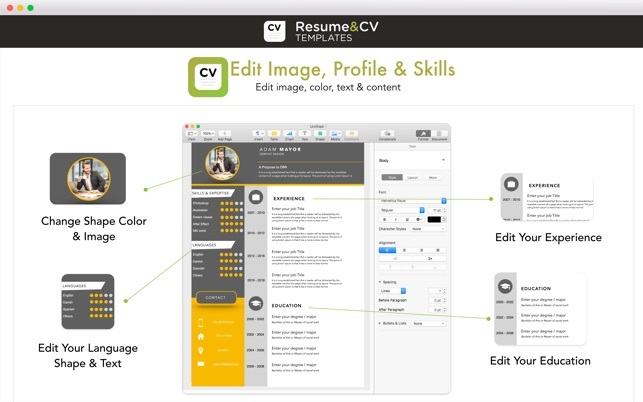 •	Resume maker is easy to use Mac OS version. 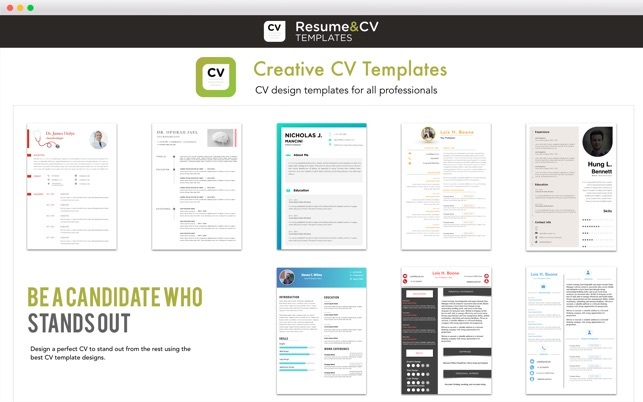 All you need is to download and install this CV maker app to create an impressive resume. This CV maker or resume designer, Mac OS app, is amazing and it can be a career-changing app for you. Sleekly designed CV created by using this Resume Creator can impress any HR Manager or the employer. 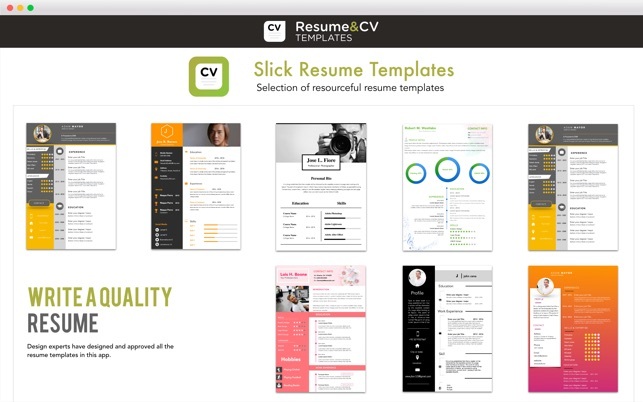 If you are starting your career and looking for the job, then you must download this CV & Resume Template for Pages app on your MAC PC today and change your world. Note: You will need Pages to use this flyer maker app, so make sure to have the latest version of 'Pages' installed and running perfectly on your Mac device. Drafting my cv was always a headache for me but this app is simply amazing. 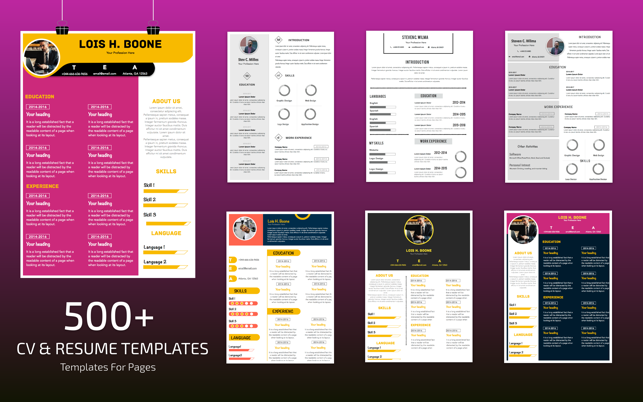 I loved all the cv templates in this app and now I often get confused which resume templates to choose as every template is elegantly designed. If you want to design an amazing cv then this app is highly recommended. We are obliged for your positive feedback! How can I get my money back? these templates are terrible for the legal proffesion and Im having the hardest time editing them at all. I havent had the app for 24hr and hate it. How do I get a refund? False advertising!! The templates are preview only & can not be edited. I could have seen the same templates for free on google images. I hope the apple store shuts you down.